Yummy no bake chocolate tart, made up of two classic ingredients : Chocolate and oreos ! This is the first tart recipe on my blog. There are two types of tarts : A Baked Tart and A no bake tart. As this is my first tart recipe, I thought of sharing an easy one. Thus today we will learn to make a no bake tart. And what better than a chocolate tart, right? This is a quick and easy chocolate tart recipe. The base of the tart is made using Oreo biscuits and butter . We will crush Oreo biscuits and powder them in a blender. Then we will add melted butter in the bender jar and again blend these ingredients. this will form a dough type mixture. The next step is to put this dough type mixture of Oreo biscuits and butter into the tart mould and press the mixture evenly so that the mixture covers all the sides and the base of the tart mould. As we want the base of the tart to be a little firm we will place this mixture (that we added in the tart mould) in the fridge for atleast half an hour. The next step is to prepare the filling of this tart. As this is a chocolate tart recipe we will use dark chocolate or milk chocolate for preparing the filling. For this, chop the dark chocolate or milk chocolate roughly into pieces. Now take a small pan and add cream and butter into it. Keeping the flame low, heat cream and butter. remember we just have to heat the cream and butter till they get warm. We do not have to boil these. So, when the butter has melted and when you can see some small bubbles in the mixture, then switch off the flame and pour this cream + butter mixture on top of the chopped chocolate. We will leave this mixture u disturbed for five minutes. This step is important as we want the chocolate to melt. After five minutes we will whisk/mix this mixture. You will see that the chocolate will gradually melt and the homogeneous dark chocolate mixture will be formed. this is our chocolate ganache (the filling of our tart). We cannot add this filling into the tart mould while it is still hot as that can melt the base of the tart. Therefore allow this filling to cool down for ten to fifteen minutes. Now the only step left is to add the filling on top of the tart base. So after fifteen minutes, take out the tat mould and pour the filling on the top. If you want you can decorate this chocolate tart or you can simply leave it like this only! I have added some chopped almonds and desiccated coconut on the top. 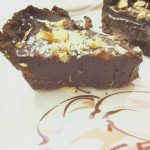 Keep this No Bake chocolate tart in the fridge for atleast six hours, so that the chocolate sets. After this the chocolate tart is ready for you to serve. You can serve this at a house party or any birthday party or a simple get together. This will surely become the highlight of your lunch/dinner. If you don’t have a tart mould, then also you can try this recipe. You can choose a Shallow bowl (katori) which can be either round or square for making this. I would surely recommend you to buy a tart mould if you want to make this recipe again or if you want to try more tart recipes as that would be helpful. If you do not have the regular tart mould or if you want to make mini chocolate tarts, then also you can use the same recipe. The procedure would be same for making the tarts base as well as the tart filling. This recipe should give you approximately five mini chocolate tarts. Do try this recipe. 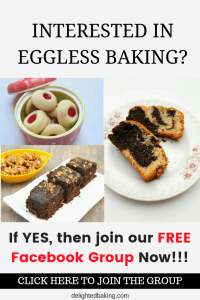 If you have any questions regarding this recipe, feel free to ask them in the comments below. Bread Pizza - Instant alternative to our regular pizza. Perfect for kids as well as for grown ups. Take a mixer jar. Add oreo biscuits and melted butter. Blend till this forms a dough type mixture. Now put the whole mixture into a tart mould. Press it so that the mixture covers all the sides of the tart mould. Keep this in fridge for half an hour. Meanwhile, prepare the topping. For this, in a bowl add chopped dark chocolate (or milk chocolate). If you don't have dark chocolate you can use milk chocolate like dairy milk. Now heat the cream. Take a small pan, add cream and butter. And on a flame heat it. Remember we just have to heat it till it gets warm. We don't have to boil it. So when you see 2-4 bubbles in the cream, it means the cream has reached the required temperature. Switch off the gas and pour this cream on top of chopped chocolate. Leave this mixture for 5 minutes. After 5 minutes, wisk / mix this mixture. You will see that the chocolate will melt and this would become a homogeneous dark colored mixture. This is our chocolate ganache or the topping of our tart. Now leave this mixture for 10-15 minutes or till it gets cooled. After 15 minutes take out the tart base. Pour the topping on the top. If you want you can decorate it or you can simply leave it like this only. I have added some chopped almonds and dessicated coconut on top. Keep this in fridge for at least 6 hours.